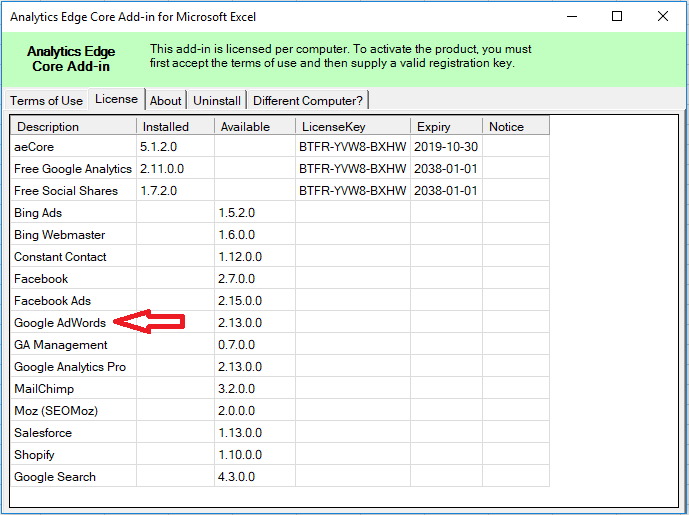 Welcome to the Analytics Edge Core Add-in! Get ready for some simple Excel report automation. Just register the add-in, add an account, and start making your queries! How can I help? The Core Add-in includes confidential email support, even during evaluation. Download and install the Core Add-in from the Download page. Optional functions let you modify the results. Refresh All refreshes all queries in the workbook, or Schedule them. If you have purchased a license key after the trial expired, you can enter it here. The Analytics Edge Core Add-in supports both Quick Queries (compatible with the Standard Add-in) and Macros. When you make a new connector query, a popup will appear asking if you want a Quick Query or Macro. If you already have macros in the workbook, you may need to close the Task Pane to create a Quick Query. The Core Add-in adds the ability to modify your results before writing them to your worksheet. You can Pivot your results, Arrange the columns, Sort , and Filter the results before Writing to a Worksheet. When your Connector query is finished, the Core Add-in will open a Functions Wizard allowing you to make these transformations to your data. 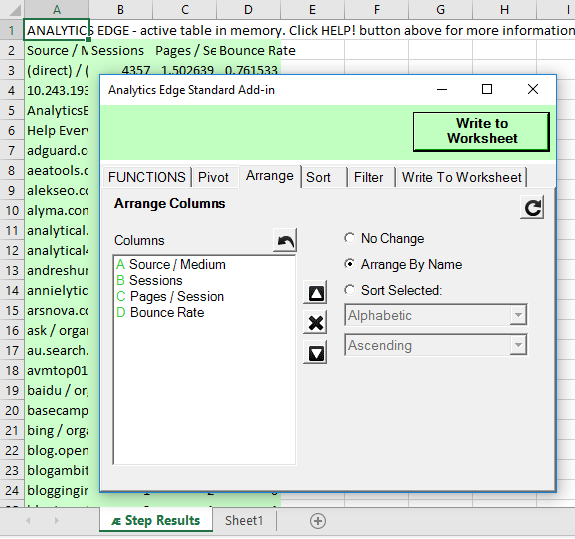 To accept the data as-is from the connector, simply click Write to Worksheet. A temporary worksheet (ᴁ Step Results) highlighted in green will appear with the interim results, so you can see the impact of your selections on a sample of the results. When you click the Write to Worksheet button, the temporary worksheet will disappear and the full results will be written to your worksheet. The results are written to the worksheet, overwriting any previous content. You can format the results and subsequent refreshes will not alter the formatting — you are free to put your own personal look to the data. Since some queries can change the number of rows or columns returned between refreshes, the Add-in will clear the previous ‘block’ of data before writing new results to the worksheet. Keep an empty column and row between your query results and other things on your worksheet, or the Add-in may wipe out more than you expected when you refresh. You can add as many queries to your worksheet as you want. Click Refresh All to re-run all the queries [and macros] in the workbook. They will refresh in order: top-to-bottom, left-to-right. If you want to copy or move any of the queries, simply turn on the Edit Mode and copy or move the comments. If you want to copy or move the Quick Query to a different worksheet or workbook, the Edit Query button has a drop-down menu with Cut, Copy and Paste functions. Note that macros can also contain cell references, which leave comments when Edit Mode is On. If the Edit Query button is not enabled when you select a commented cell, open the Task Pane to see the macros in your workbook. Macros are managed in the Task Pane. In the simplest case, a macro would consist of a query function plus a Write to Worksheet function. As you work with your data, a temporary worksheet, (ᴁ Step Results) highlighted in green, will appear with the interim results, so you can see the impact of your selections on a sample of the results. When you add a Write to Worksheet function, the temporary worksheet will disappear and the full results will be written to your worksheet. See the orientation guide for next steps. This entry was posted in A. E. Core Add-in on 2018/06/03 by mike_sullivan.